What I was planning to write on this post is a total different story from the one you will read here. I was ready to describe in detail how to open the laptop, put the drive in and combine the speed of SSD with the capacity of traditional spin disks on your laptop. Well, you won’t read anything about that here: despite being advertised as compatible on the product page, this mSata drive won’t work on Dell precision laptops. Full stop. It’s still unclear to me if it is a firmware issue or a more troublesome problem. The fact remains: this product is not suitable for a Dell precision mobile workstation. After reading this review, I decided to buy the 120 GB drive (RCP-V-T501B-MC) for my Dell precision M4600. I could find one only at MyDigitalDiscount, an online shop I didn’t know at the time. However, the item was showing as available and I placed the order on August 29. The next day, the item was showing as “available in 5-10 business days” and remained that way for three weeks. The product was actually sent my way on September 22 and arrived in Italy on September 27. The Italian customs kept it until October 13 and I finally had the drive in my hands on October 14. You can imagine my frustration when the drive didn’t work. You may be interested to know that I’m not alone: this thread on notebookreview.com proves that other people were tricked by RunCore’s compatibility claims. I contacted the vendor to return the item and I requested a refund. I will keep you posted on the status of my request: it could tell much about this vendor’s credibility. On the other hand I also contacted RunCore to see if the issue can be solved (I highly doubt it). No news to date: I will keep you posted on this one as well, for the same reasons as above. UPDATE 2011-10-19: MyDigitalDiscont customer service contacted me today and looks like I can be refunded. I still don’t know if the refund will cover shipping costs (back and forth), but it’s a starting point. On the compatibility issue, they say that they received the list from RunCore, which I can believe, since it’s displayed on RunCore’s site. UPDATE 2011-10-20: MyDigitalDiscount will refund the returned item’s cost completely and will also pay for the shipping of a new product in substitution. I will have to pay the shipping costs for the return and I will also pay the customs expenses for the old and new order. I must say that I’m very pleased with their behaviour and, honestly, I can’t blame them for the compatibility issue. UPDATE 2011-10-21: I contacted RunCore directly and they say that they will perform some compatibility tests shortly. I’m waiting for these tests to complete before arranging the return with MyDigitalDiscont: maybe there’s a way to make the drive work. UPDATE 2011-12-01: RunCore finally decided that it was time to remove the part that claimed compatibility with Dell Precision laptops from their product page. I still wonder what would one do with this drive, as I don’t think there is any single compatible laptop on the market. Maybe this product was conceived future hardware. Go figure. Posted on October 19, 2011, in Uncategorized and tagged Dell, Laptop, mSata, Precision, RunCore, SSD. Bookmark the permalink. 7 Comments. Thanks for your post. Very useful. 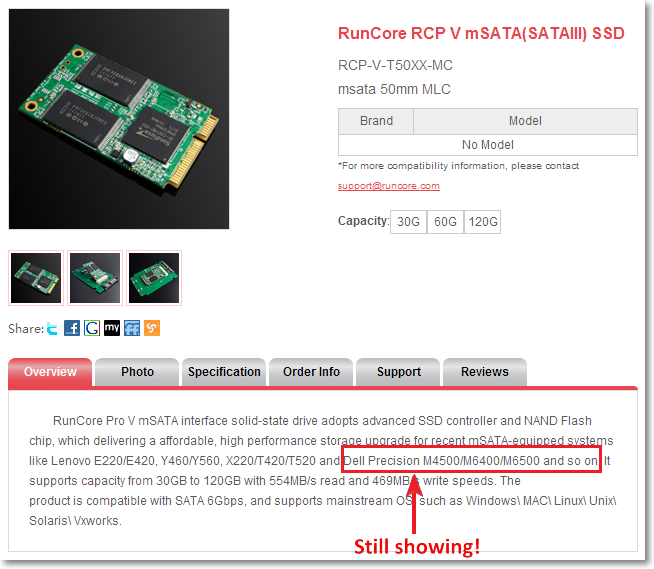 I just emailed RunCore for Compatibility because this looked like somthing interesting to consider for Dell M4600 but now know whatever answer they give cannot be trusted. Well, I would not be so “tranchant”. They have just been unresponsive and slow, but I still think they build great products. They just happened to mess with the compatibility chart on this one. BTW, I ended up buying a MyDigitalSSD 128 GB mSata SSD and it works great. Your issue was because it’s not an mSATA connector; the WWAN connector is mini-PCIe. In the tradition of PC industry idiocy they use the same connector but the signal lines are electrically different. You can still find the (rarer) mini-PCIe SSD’s but they are disappearing fast from the market. Well, sort of. mSata IS a mini-pcie port. What’s important is what seats behind that port. The one on the precision can be used as mSata or mini-pcie. Runcore confirmed it was a hardware issue they fixed in the second production batch. Hi SpagettiDBA, I’m a DBA too and recently got a M4600 supplied by my company. I only have the 750GB internal disk and want to have a second HDD – does your MyDigitalSSD 128 GB mSata SSD work for you? If so, I’d like to get this option and then use the SD card to give me three drives – the SD could be good for transaction logs. Yes, the MyDigitalSSD works for me. It’s not the fastest on the market, you might find something faster. I like the idea of a SD card for transaction logs. Just be careful the SD doesn’t get corrupt, ’cause it’s something I have seen in the past.